The Lyceum Movement spawned adult education in America, with public forums that promoted thoughtful conversation and education about the intellectual and ethical questions of 19th-Century society. The Concord Lyceum, described by Walter Harding as “one of the largest, strongest, and longest-lived of all the lyceums,” was founded in 1829. Thoreau was only 11 years old at the time, but “even in childhood [he] was never one to neglect such an opportunity for learning about the world around him. The numerous lectures he heard on geology, botany, and ornithology . . . undoubtedly were an important factor in developing just such interests” (Source: Walter Harding, The Days of Henry Thoreau, © 1962, p. 29). 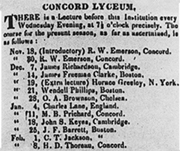 Many of Thoreau’s best-known works began as lectures at the Concord Lyceum. “A History of Myself” evolved into the first chapter of Walden. An 1848 lecture explaining his decision to go to jail was later published as the essay we know as “Civil Disobedience.” And Cape Cod, “Walking,” “Wild Apples,” and “Autumnal Tints,” all published posthumously, originated as popular Lyceum lectures.